It doesn't matter how sick you feel, or how many of your limbs have fallen off, you still have to go to school. 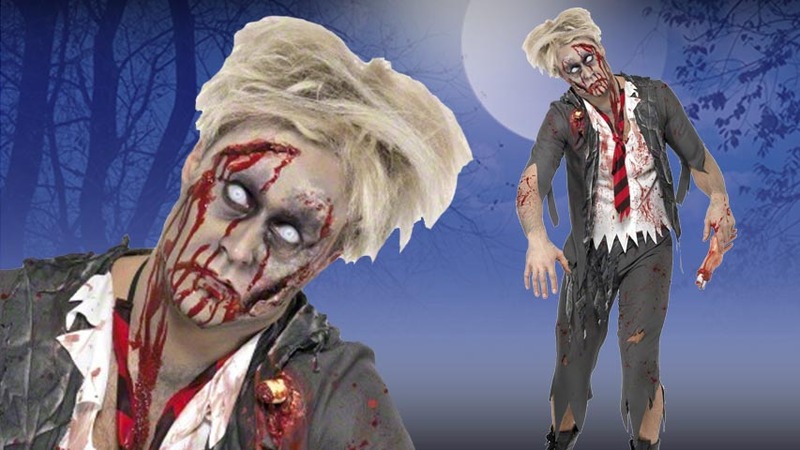 You might as well look the part, and wear this Zombie School Boy Costume to class. The teachers at school aren't going to care that you got bitten by a strangely acting homeless person in the park last night, or that you are feeling dizzy and nauseous. They know you have a big test coming up, and your classmates have already used those excuses dozens of times! So, get your uniform on before you miss the bus, or you're going to be walking to school. Judging by the way you are dragging your feet, that'll be a long walk. There's no time to pack a lunch, so you'll have to find something to eat when you get to school. And no, it doesn't matter if your uniform is all torn up and bloody, you should have thought about that before you let it happen! Luckily, even as an undead student, you'll still meet the school's dress code with this tattered, blood splattered uniform jacket and attached shirt front. 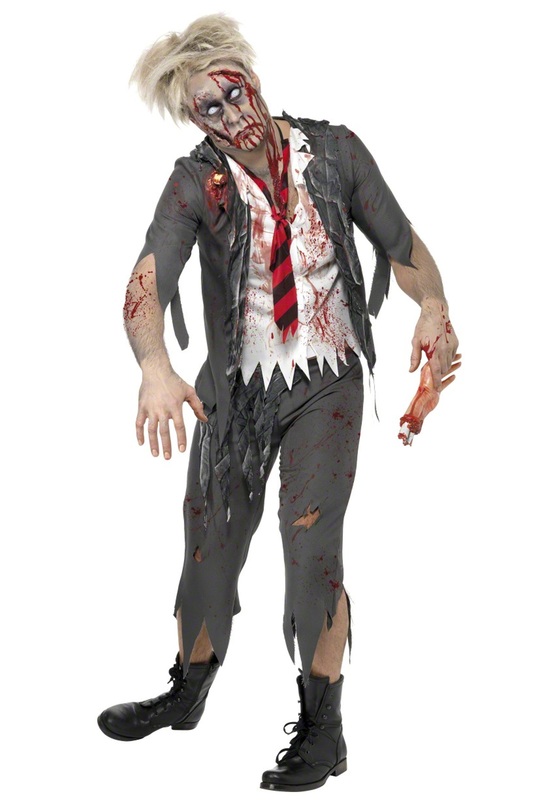 The matching uniform pants and necktie are also nicely zombified, and go nicely with any scary accessories. When deciding what kind of makeup to put on, ask yourself if you want to look like a classic, gray skinned, shambling ghoul, or do you want to get a little gorier to match the bloody uniform? Whatever style of walking corpse you decide to be, you still have to get to class if you hope to get into a good zombie college.